Dustin Arand’s Truth Evolves is a philosophy text that aims to present truth as a fluid, culturally contingent concept, without getting mired in the challenges of ethical and epistemological relativism. In other words, Arand’s goal seems to be to convince readers that truth isn’t fixed, while also that recognizing that this fact hardly means we can do or believe anything we want. 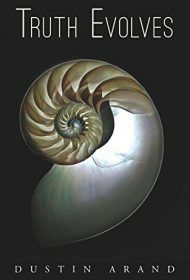 Arand uses a nuanced understanding of evolution to create a metaphor for how truth evolves, but also goes beyond that metaphor to show how human brains have actually evolved to perceive and believe the way they do. Lessons learned from this include why we are predisposed to religion (even though religion appears to lack credibility) and why our moral intuitions are (and should be) as they are. Throughout, Arand takes great care to avoid the pitfalls and fallacies (e.g. the naturalistic fallacy) common among philosophers who attempt to link ethics to biology, and he’s largely successful. Arand presents Truth Evolves as an accessible work, even for lay readers. But readers without a background in philosophy may have difficulty keeping up with the breakneck speed with which he references other thinkers and concepts, and while he explains much of it as he goes, Truth Evolves is really better suited to philosophy devotees. Despite the number and complexity of the referenced ideas, however, Arand generally succeeds in using clear language to untangle it all. Advanced readers familiar with Arand’s references might occasionally question his characterization of some concepts. His understanding of Kant’s synthesis of rationalism and empiricism, for example, has Kant relying on God’s existence, and many a Kant scholar would differ with this. Additionally, readers may wonder whether Arand has earned all of the conclusions he draws (has he really managed to close the door on relativism?). But every reader should be impressed by the quality of scholarship, ambition of the project, and clarity of style that he brings to the table with Truth Evolves.